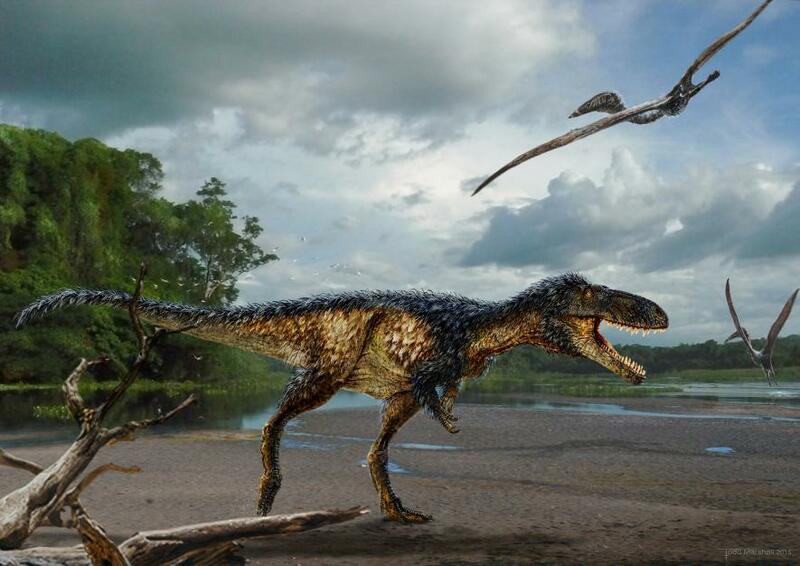 Tyrannosaurids—the familiar group of carnivorous dinosaurs including Tyrannosaurus and Albertosaurus—were the apex predators in continental ecosystems in Asia and North America during the latest Cretaceous (ca. 80–66 million years ago). Their colossal sizes and keen senses are considered key to their evolutionary and ecological success, but little is known about how these features developed as tyrannosaurids evolved from smaller basal tyrannosauroids that first appeared in the fossil record in the Middle Jurassic (ca. 170 million years ago). This is largely because of a frustrating 20+ million-year gap in the mid-Cretaceous fossil record, when tyrannosauroids transitioned from small-bodied hunters to gigantic apex predators but from which no diagnostic specimens are known. We describe the first distinct tyrannosauroid species from this gap, based on a highly derived braincase and a variety of other skeletal elements from the Turonian (ca. 90–92 million years ago) of Uzbekistan. This taxon is phylogenetically intermediate between the oldest basal tyrannosauroids and the latest Cretaceous forms. It had yet to develop the giant size and extensive cranial pneumaticity of T. rex and kin but does possess the highly derived brain and inner ear characteristic of the latest Cretaceous species. Tyrannosauroids apparently developed huge size rapidly during the latest Cretaceous, and their success in the top predator role may have been enabled by their brain and keen senses that first evolved at smaller body size.